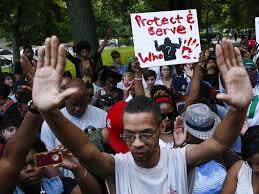 The media has portrayed a picture in Ferguson, MO of violence and mayhem. No doubt racial tension is high and those clamoring for justice on both sides of a tragic death of a young black semi-adult believe themselves to be defenders of truth. Just what the actuality of that truth is has yet to come to full expression. What is clear is that fear mongers and racial instigators have found a platform, and the people of Ferguson and the Greater St Louis area are pawns in their drama. Although all eyes may be on Ferguson, I believe the Lord’s face was turned to a small neighborhood about 17 miles away in the historic city of Alton, Illinois. Nestled on the banks of the Mississippi River, the city of Alton is both beautiful with old buildings built into the steep incline of the hills off the river; and struggling as you see obvious financial decline as you cross the state line. But on Saturday, August 23, 2014, a demonstration of the kingdom appeared in stark contrast to the mayhem we see on the television. We were privileged to join King Jesus Fellowship, Alton Bible Church, and For His Glory Ministries as we set up in a park in the middle of what most would consider a rough neighborhood in order to offer the love of Christ. There were two specific things the Lord impressed upon my heart that I want to share. The first being that as we lifted the name of Jesus, there were no racial divides. King Jesus Fellowship is a small house church led by Pastor Chris and Shelley Clegg. They are a predominately white fellowship who are very active in standing for the preborn in their community. Alton Bible Church is a predominately black church led by Pastor Fred Hendricks. They also love to get out of the four walls of their church building and minister to the community. Rob Welch is an evangelist with For His Glory Ministries who has just recently returned from preaching crusades in Tanzania where he saw 1000’s give their hearts to Christ. We also met Rob’s assistant, Anita who is a strong prayer warrior and an older gentleman called Brother Boogie. Brother Boogie is an ex-bank robber who was led to the Lord while in prison. His sentence was reduced and he started a moving company called CONS which stands for Convicts Once Now Saved. He would only hire ex-cons who loved the Lord and wanted a fresh start. This was our team for the outreach in Alton; black, white, small ministries, and large. What was beautiful to see was that no one came with their own agenda, we all just had a part to play as the Holy Spirit called out to those who were in desperate need of peace. While we were setting up, we met a young black man (about 13 years old) who had been given a walky-talky that would contact the police department. The police had given him an assignment to watch the neighborhood and report any suspicious activity. It gave him a sense of responsibility for his community instead of getting caught up in the struggles of an impoverished neighborhood. As soon as the praise started, this young man brought a young teenage lady to us. She prayed to receive Christ and then proceeded to cry cleansing tears for a solid hour. Because of the scorching heat, we didn’t get the turn out in the park we would have liked, but a woman came to tell us that our message was clearly heard throughout the neighborhood. Mike left the park and walked through the houses stopping to pray for those that were sitting on their porches listening to the message of hope being offered. The Lord touched one man who had just undergone knee replacement surgery. He told his family that the Lord was healing his knee. There are other stories, but what I want to stress is the message that was presented. Everyone who stood to speak addressed that racial tension and financial status is not our greatest need. We all start from the same place – in desperate need of a savior because of the sin that runs rampant through our beings. In a hotbed of racial controversy, Jesus showed that when He is allowed to reign, all that divides is brought together in unity to the glory of our Creator. The second thing was this. The Lord has been introducing me to small pockets of hungry hearts lately. Some are in small house churches. Some are small prayer groups. Some are simply individuals that we meet in the park. What I hear in all of them is the belief that revival is coming. Most have been deeply wounded in their churches or are very discontent with simply playing church. All of these groups have a heart to reach hurting, broken people. None of them have the resources on their own to accomplish the vision the Lord has given them. But in Alton, Illinois, I saw what could happen if we began to band together. What we could not have done on our own, the Lord brought about. All the elements of a great tent revival were in place. We had worship, we had intercessors, we had those who served food and ministered to children, we had phenomenal testimonies of the grace of God, and we had a powerful evangelist who laid it all out on the line. But most importantly, we had the message that will bring peace where there is hostility and joy where there is brokenness. Wife, mother, grandmother, student, teacher, mentor who loves Jesus. This entry was posted in Outreach and tagged joy, peace, racial divide, revival, st louis. Bookmark the permalink.